2016, London, Piano Nobile, Aspects of Abstraction: 1952-2007, cat. no. 21, col. ill. p. 65. “…a very powerful proto-place and quite the most religious place I’ve ever been to…I’d get up at four o’clock every morning, drive to it, and spend the whole day doing the circumference walk. Unbelievable things revealed themselves every day. I felt deeply connected with it, and with a kind of possible interpretation, a symbolic interpretation of the holes and the strips of stone that seem to be leaning against it. I was amazed, not at the monolith, but at the way the monolith seemed to be made up of symbolic events”. Mountainous forms had previously featured in Kapoor’s earliest pure pigment sculptures including As if to Celebrate, I Discovered a Mountain Blooming with Red Flowers, 1981; 1000 Names, 1982; and Mother as a Mountain, 1985. For Kapoor, the mountain was the site of a potent synthesis of cultural, historical, religious, mythological and psychological significances, imbued with a latent spiritual and physical force. In both Hinduism and Buddhism, Mount Kailash in the Himalayas is the seat of spiritual power, whilst Mount Sinai is a sacred biblical site in Islam, Judaism and Christianity. Kapoor has described how his practice is based on research, or ‘excavation’ as he terms it, and various strands of his multifarious interests combine in the form of the mountain in a series of correlations. Microcosm and macrocosm unite in the peak of the mountain, a physical bridge between the sky and the land, but a metaphorical link between heaven and earth, the human and the natural world, male and female. Binaries and dichotomies are traversed with a certain Freudian slippage and coincidence; elisions which fascinate Kapoor. As Germano Celant has written, “For Anish Kapoor, the magic of artmaking lies in continually rethinking and representing the exemplary act of creating a universe”. In the mid-1990s Kapoor created two large-scale mountains formed from layers of fibreboard, Untitled, 1994; Private Collection, Turin, and Untitled, 1994; Vancouver Art Gallery, Vancouver, one with soaring peaks and the other a gaping chasm - a ying and yang of masculinity and femininity. 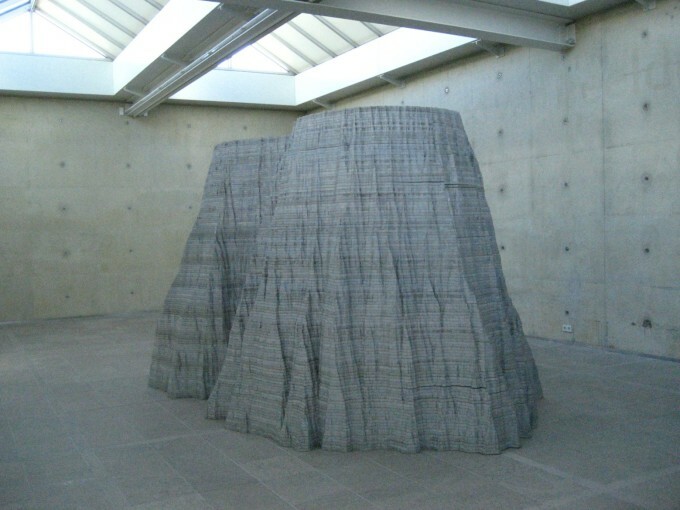 In 1994, Kapoor was commissioned by the municipality of Tachikawa to produce a sculpture: the result was the vast cast-iron Mountain, a monumental representation of the jagged crests of the preceding fibreboard Untitled. Seven years later, Kapoor was commissioned by the city of Malmö in Sweden to create the second Mountain, this time with an aluminium shell containing a central void, for the festival Bo-01, to celebrate the redevelopment of the industrial coastal landscape of the city into urban living. Mountain on display at the Museum Beelden aan Zee is the second iteration of an edition of three of the sculpture, with the first the Malmö version and the third yet to be fabricated. Kapoor has a longstanding fascination with the void: a series of works including Descent into Limbo, 1992; De Pont Museum, Netherlands, preceded Mountain, 2002. Speaking to Nicholas Baume, Kapoor described the void as “not an empty dark space, but a space full of darkness”. Unlike Descent into Limbo, the void of Mountain cannot be penetrated, and only seen from above as the towering structure prevents vision into the centre. The void provokes an awe-inspiring sublimity, the promise and terror of infinity, the fear and delight of being consumed. Vertigo-inducing blackness both fascinates and repels us. For Kapoor, who has undergone decades of psychoanalysis, the void is seen in Jungian terms: the blackness of the void threatens the disintegration of the ego in the unknown, the loss of one’s ability to distinguish between oneself and one’s environment. “Void is really a state within…There is nothing so black as the black within. No darkness is as black as that.” The topography of Mountain elides with the psyche and physiology of the body. The fragmented manner in which we must understand the vast totality of Mountain - through disjointed glimpses of sections of exterior and interior that we must reconcile in the mind’s eye – reflects our embodied lived experience. An encounter with Mountain channels the phenomenology of our existence, in which all experiences are filtered through our bodily actuality. The darkness of the void is a site of uncanny experiences, a site of pre-conscious knowledge, of “something half-known or half-remembered”. In Freud’s essay on the uncanny, the unheimlich or literally ‘unhomely’, the earliest memory the uncanny invokes is that of the intrauterine space of the womb. The interior void of the mountain, enfolded by protective external walls, suggests the enclosure of the womb, a decidedly feminine space. The chasm – of the mountain, of the womb – promises creativity and life, the fecundity of Mother Earth or the Great Mother of ancient mythology and Jungian psychoanalysis. For Kapoor, within the void “one can somehow look again for that very first moment of creativity where everything is possible and nothing has actually happened. It’s a space of becoming”. The fecund space of the womb of Mountain echoes the topographic origins of the earth represented by mountainous landscape formed by the earliest tectonic movements. Exploration of origin mythology recurs in Kapoor’s oeuvre, particularly in the idea of the ‘proto-form’ - pre-conscious knowledge. For Kapoor, pure colour is a route to “the symbolic, to in some ways, the proto – the before words, the before thought, the thing in your gut, the visceral”. The whiteness of Mountain, following the White Dark series of the mid-to-late 1990s, is not an absence of colour but a positive statement of purity, of beginnings, of primeval rock, what Pier Luigi Tazzi has termed in the White Dark series a remembrance of the “phantasmic body, almost a recollection of intrauterine life”. The feminine interior space is juxtaposed with the severe ruggedness of the exterior structure of Mountain. 120 layers of 2 cm wide aluminium are stacked into the majestic towering structure of Mountain. The unevenness of the layers leaves the surface craggy and jagged, suggestive of a primeval rock formation. As Nicholas Baume has discussed, Kapoor may look back to the mythology of historical and cultural origins but his visuality and materials employ a truly modern sensibility, a re-imagining of aesthetic sensibilities and artistic process. For Mountain the layers of aluminium were cut by water-jet: streams of high-pressured water directed at the aluminium with such force as to slice the aluminium with immense precision. This cutting-edge fabrication method and the process of stacking aluminium shells to build up the structure pre-empts contemporary 3-D printing practices, foreshadowing radical technological developments. The water-jet procedure also serves to remove the artist’s hand from the creation of the sculpture. Kapoor has frequently returned to the idea of the ‘auto-generation’ of an artwork as he terms it, or svayambh, the Sanskrit term meaning ‘self-generated’ or ‘born of itself’ and the title of Kapoor’s seminal moving blocks of red wax. Throughout his career, phallic and vaginal forms and the alchemical possibilities of their union have fascinated Kapoor. The concept of spontaneous germination is suggestive of an alchemical primordial potency, present in Mountain in the tension between the feminine interior space and the harsh masculinity of the exterior; and between the soaring peaks of Mountain, 1994, and the cavernous void of Mountain, 2002. A majestic presence of immense proportions, Kapoor’s Mountain is spectacular, awe-inspiring and visceral yet without self-conscious grandeur. Instead, an aura of mysterious potency, of latent energy and sacred revelation emanates from the structure. Mountain occupies a seminal juncture in Kapoor’s career, a synthesis of his earliest concerns with mythological origins, the natural world, phenomenological experience, religious sites and primordial potency. Anish Kapoor is one of the most influential sculptors of his generation. Perhaps most famous for public sculptures that are both adventures in form and feats of engineering, he manoeuvres between vastly different scales, across numerous series of work. Anish Kapoor was born in Bombay, India in 1954 and lives and works in London. He studied at Hornsey College of Art (1973–77) followed by postgraduate studies at Chelsea School of Art, London (1977–78). Recent major solo exhibitions include Chateau de Versailles, Versailles (2015); The Jewish Museum and Tolerance Center, Moscow (2015); Sakıp Sabancı Museum, Istanbul (2013) and Martin Gropius Bau, Berlin (2013). He represented Britain at the 44th Venice Biennale (1990), for which he was awarded the Premio Duemila. He won the Turner Prize in 1991 and has honorary fellowships from the London Institute and Leeds University (1997), the University of Wolverhampton (1999) and the Royal Institute of British Architecture (2001). He was awarded a CBE in 2003 and a Knighthood in 2013 for services to visual arts. Most recently he received an honorary doctorate from the University of Oxford (2014). His work is held in all major international public collections including the De Pont Foundation, Tillburg, Holland; Tate, London, UK; MoMA, New York, USA; and the Rijksmuseum Kroller-Muller, Otterlo, Holland.